Despite several advancements in dentistry, tooth loss remains a prevalent problem for many Americans. In fact, at least 120 million adults are missing one tooth or more while another 35 million people do not have any of their natural teeth remaining. At Oakbrook Dental and Orthodontics, we understand the struggles your face. We have the solutions you need for multiple tooth replacement in McKinney. Now, dental prosthetics look and feel more natural than ever to improve your confidence and your quality of life. 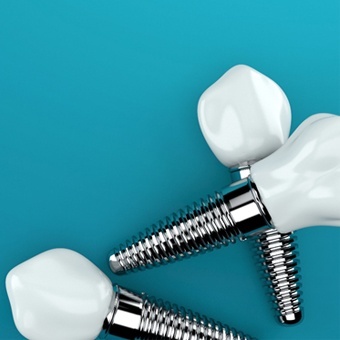 Besides traditional treatments, you can also enjoy the security of dental implants. We perform a comprehensive consultation to determine which solution is right for you. 1 to 3 missing teeth are traditionally replaced with a crown and bridge because it is economical and convenient. We take an impression of your mouth to craft prosthetic teeth to fill the space of the missing teeth. It is held in place by reshaping your adjacent teeth to place custom-made dental crowns over them. This allows you to enjoy a treatment that lasts about 5 years before needing to be replaced. 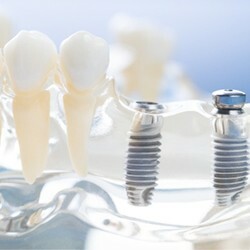 As an alternative to a traditional bridge, you can anchor the device in place using an implant post at either end. This eliminates the need to alter healthy teeth while providing them with the support they need to stay in place. The posts are surgically placed into your jawbone to mimic the roots of your teeth. Your bone fuses to the posts, allowing them to potentially remain in place forever. You can replace several missing teeth with partials. Your replacement teeth are created to match the appearance of your natural ones. They are featured in a gum-colored base and held in place using a clip or clasp on your adjacent teeth. 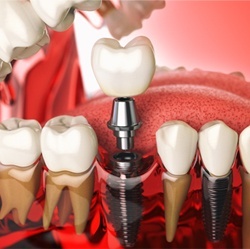 Now, you can invest in a more permanent solution using dental implants. Implant posts anchor your partial to your jawbone to allow it to stay in place for several decades. You can restore as much as 70% of your biting force to enjoy your favorite foods again. 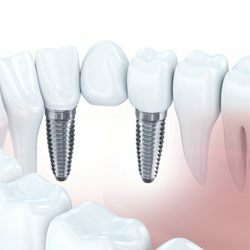 How Do I Determine Which Implant Solution is Right for Me? We perform a comprehensive consultation to assess your oral and general health. Based on the information and your lifestyle, we will help you determine which treatment best meets your needs. Does Replacing Multiple Teeth Impact the Cost? There is no set amount you can expect to pay for your new smile because the cost is determined by several factors, such as the type of dental prosthetic, the number of teeth you are replacing, and the materials used. We help you maximize the value of your dental insurance and accept a variety of payment options to keep your new smile affordable. You can overcome the challenges of missing teeth with Oakbrook Dental and Orthodontics. Contact our office today to schedule your consultation for a functional, beautiful smile.